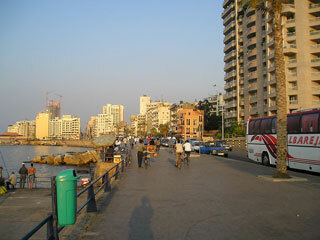 The Corniche Beirut is a seaside promenade in Beirut Central District, in Beirut, Lebanon. Lined with palm trees, the waterfront esplanade offers visitors a magnificent view of the Mediterranean and the summits of Mount Lebanon to the east. Corniche Beirut has its foundation in the Avenue des Français, which was built during the period of the French Mandate of Syria and Lebanon along the seafront that extended from the old town. This article uses material from the Wikipedia article "Corniche Beirut", which is released under the Creative Commons Attribution-Share-Alike 3.0 License.